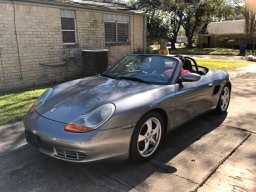 Just bought a 2001 Boxster in early January. Once I received it I changed the oil and filter and saw the engine had more oil (1/2 gallon more). I was expecting the issue could be resolved after changing and filling just the necessary oil but still leaking…. Any ideas? Then a couple of weeks after getting the car, the engine light turned on (error P0430). I was finally able to pass the emission test using Cataclean. Also noted the clutch is “high and short”. I hope this is not a serious issue. When shifting Clutch does not slip. Any suggestions? I also noted some suspension noises in the rear suspension also. What can I do to define what it is? Even with all that, at home we absolutely love the car and want to enjoy it! Thanks for adding me to this forum. I really enjoy your stories, cars, comments!